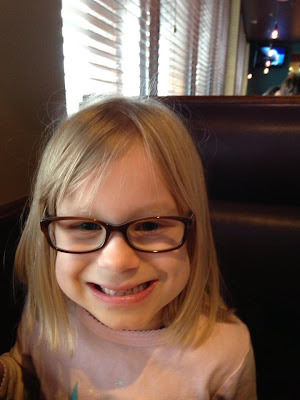 Mommy's Favorite Things: Avery got glasses! For a few months now we've been noticing that when Avery looks down her right eye turns in and then when she looks back up it takes a second or two to refocus. So we took her to the eye dr. He basically said it's a lazy eye, but wanted her to see a specialist first. So we took her to a Pediatric Ophthalmologist and he confirmed that she needed glasses and had a lazy eye. So we ordered them and we just picked them up yesterday! She's excited about them, which I guess is good in a way because she'll be more careful with them, but I wish she didn't need glasses. He's hoping that her eyes will be totally fine and corrected when she hits puberty. Actually he sounded pretty confident that they would be. We go back in about 6 weeks to get her eyes looked at again. He said he'll know if there's been a change in just that short amount of time. If there's not she'll need a patch over the good eye to help the bad eye correct. But here she is in her Juicy Couture glasses! She had torticollis as a baby and they think this is related since it's a weak muscle basically. And it's the same side. We already notice a difference though, her eye doesn't turn in when she's wearing them. My 5 year old daughter has to wear one and I've done a couple reviews. I hope this works for her. I've worn glasses since I was in the third grade to do German measles. She's a cutie! Very cute! I wore glasses & a patch when I was younger. Hated it but it did work! Oh my goodness, she is so sweet with that big smile! If I needed glasses, I would definitely want a pair of those! I hope the glasses do the trick! My son has had to see a pediatric eye doctor since birth. He had an eye lid that didn't open for the first 2 weeks of his life, and now it doesn't raise as high as the other when his eyes are open. I'm hoping they can correct it before it harms his vision. My daughter had it in both eyes, but it was bad enough she had surgery when she was 6 months old. She has one that has a tighter muscle from the surgery so it doesn't go with the other when she does certain extreme looking to the side or up. I hope the glasses do the solution for your daughter..she looks super cute in them! Hi, I just left a super long comment, that went into cyber space somewhere. :( Just wanted to say my daughter recently started wearing glasses too, shes 4. She has a friend that uses a patch over her glasses to help with her lazy eye, and it has helped her a lot. Awww! She's so cute in her glasses!